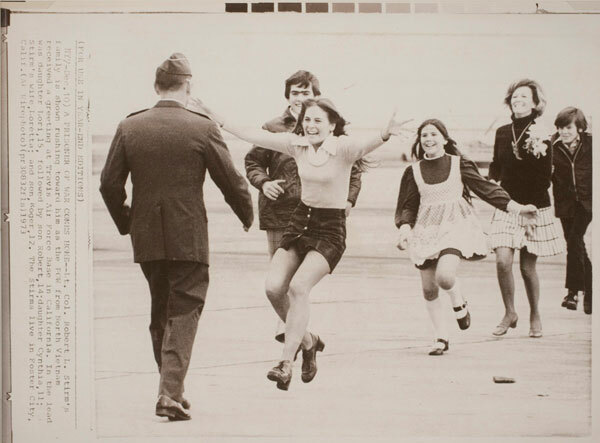 Standing on the tarmac of Travis Air Force base, Veder snapped this photograph of Lieutenant Colonel Robert L. Stirm greeting his family after six years in Vietnam. Stirm had been a prisoner of war since his plane was shot down over Hanoi in 1967. After taking this photograph of fifteen-year-old Lorrie Stirm running into the arms of her father, Veder rushed to a makeshift darkroom in a ladies' bathroom on the base (United Press International had commandeered the men's). Robert Stirm looks back on this photograph with ambivalence. He said that he remembers being so happy seeing his children, but only three days earlier a chaplain handed Stirm a letter from his wife Loretta letting him know that she had moved on in his absence.